Closing arguments will be submitted on April 21st, and responses due April 26th, in the hearing concerning proposed land use code changes affecting backyard cottages and other ADUs. The city contends that the proposed changes will be radical enough to spur a wave of new construction in residential neighborhoods while not adversely impacting them. Others disagreed. In hearing an appeal brought by the Queen Anne Community Council, the Seattle Hearing Examiner ruled that City's original SEPA response was not adequate. This ruling launched a full blown study (EIS) into the potential environmental impacts of the proposed code changes. The Final EIS was issued last fall and the findings were again challenged. The appellants claim the EIS does not fully assess the impacts of increased development in residential neighborhoods. For the appeal, Tree PAC (concerned with the potential loss of urban tree canopy due to increased development), have joined the Queen Anne Community Council. If the Hearing Examiner rules that the EIS is sufficient, the City Council will consider legislation to implement the proposed Land Use Code changes as early as early summer. Fremont residents Paul and Caroline’s backyard cottage project started as a teardown and rebuild of an aging garage behind their main house. The original goal? To have a new space for their pingpong table. But the plan evolved into a two-story structure of 800 square feet, with living space on the second story. Paul designed and built the backyard cottage and microhouse handled the permitting and land use requirements. This interview with Paul and Caroline has been edited for length and clarity. 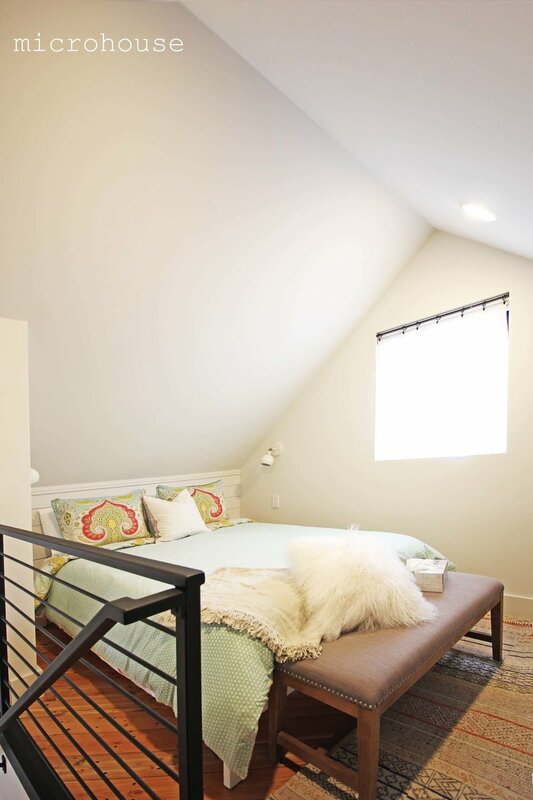 Sitting atop a first story garage, the DADU’s open, airy top floor is a versatile living space that is perfect for the homeowners and their guests alike. Backyard cottages can be used for many things including housing a family member or as a short term rental. Join Bruce Parker from Microhouse and Stefan Hansmire from Hansmire Builders to learn more about how to plan for and establish a realistic budget for your cottage. Bring your ideas, after the presentation we will have plenty of time to answer questions about the specifics of your project. Thank you to our hosts and those were able to attend our recent backyard cottage open house. Here are some interior photos. Learn more about backyard cottages and meet others who have built or are thinking about building a backyard cottage! Colette and Chris built this backyard cottage as a short term rental. Their cottage cottage takes advantage of the sloping site to create a unique three level design. It features a generous master suite, a living room with vaulted ceilings and an 2nd bedroom/office on the top floor. 2 Bedroom, 2 Bathrooms. The cottage will be open Friday September 21st from 4:30 to 7:00 pm. Email info@microhousenw.com for more information. 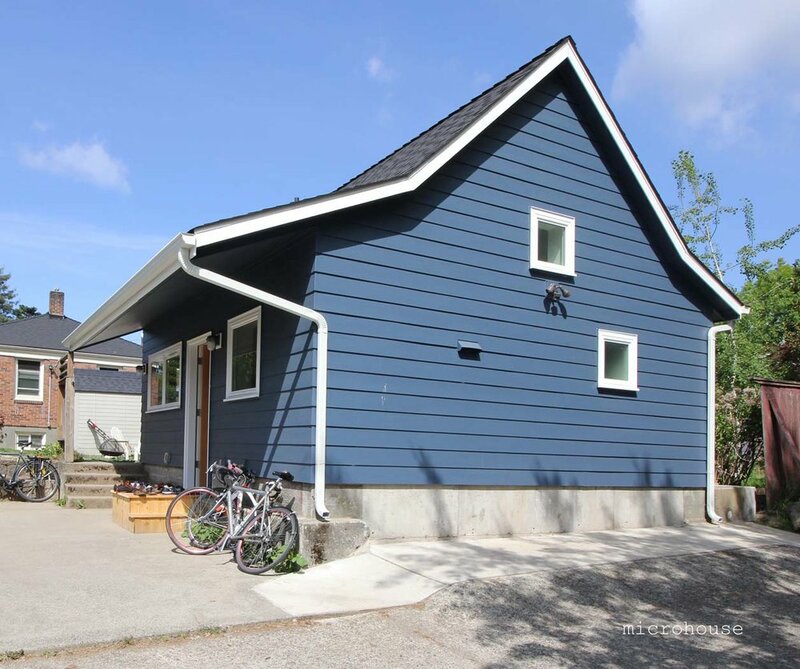 In honor of bike everywhere month we are hosting an informal bike tour of backyard cottages in Fremont, Greenwood, and Ballard this coming Saturday, May 26th. The ride will begin in Fremont at 9:30 am. Included in the tour will be four very different DADU garage conversions. Contact us or sign up for our open house invite list for details. The first question we typically answer is what can we build? As the cost of building a backyard cottage is not insignificant, it makes sense to make a careful analysis of both the governing regulations and the potential for each site. It seems obvious that an erroneous or incomplete knowledge of land use and building codes can lead to expensive mistakes and delays. What might be less obvious is that lack of informed planning may also lead to a failure to realize the full potential of a particular site and use. This Columbia City property is shared by two sisters who are planning to build a family compound with separate houses. They were worried that an 800 sq. ft. cottage would not be adequate for a growing family. They felt that it was important for the cottage to have a kitchen, living, full bath, and 2 bedrooms on the main level in addition to a separate family room, office and 1/2 bath. A tall order for 800 sq. ft..
For them, the solution was to add a basement level -- as below grade basements are not counted towards the allowable area. This also reduced the height and bulk of the cottage which is another consideration when adding a DADU to a typical Seattle lot. Fortunately, the owners have a couple of things working in their favor. One is that they have a relatively large lot which allowed them to build 800 sq. ft. on one level. The other is that the owner's father is a contractor and who built them a scaled mock-up that we could use to help model the visual impacts to on their yard. In this case, the cottage was designed to be just large enough to block the view of a series of new apartment buildings, but not so large as to adversely shade their yard. FAQ: backyard cottage allowable size - storage areas, attics, garages, and carports are included in the allowable area. It is important, but not always easy, to get a handle on how a cottage will feel in the backyard. 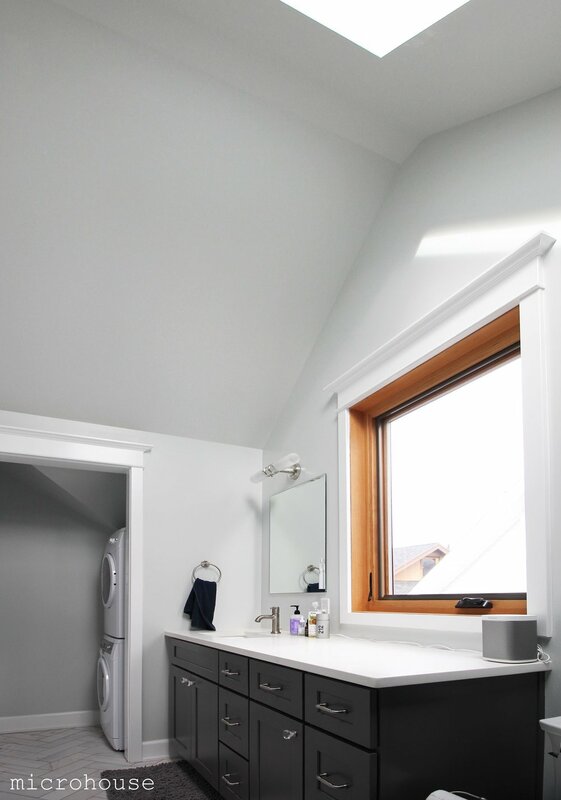 We often start by pacing out the dimensions of typical cottages with our clients. We think of 400 sq. ft. as being the minimum footprint for a single level 1 bedroom cottage. However most cottages we design have a 2nd floor to maximize living area while keeping the footprint to a minimum. This one bedroom backyard cottage has a footprint of 336 sq. ft.
Just getting started? We recommend attending one of our backyard cottage tours, which happen periodically throughout the year. They provide an opportunity to get a sense for the size of DADU's both inside and out. You can use the widget at the top of the page to sign up for our open house invite list. Looking for backyard cottage ideas? Please visit our work tab. This morning SDCI staff briefed the city council on proposed changes to the land use code affecting backyard cottages. The changes are part of omnibus code update, a collection of amendments that are relatively small in scale, and have a limited scope of impact, into an “omnibus” bill. If you were hoping, as we were, that clarification on gross square footage or parking or other hot topic items you will be disappointed. However, if you live in a shoreline area you can now build a backyard cottage. The original legislation concerning backyard cottages prohibited DADUs on lots if any portion of the lot was within a shoreline district. It is not clear what the intent of the original legislation was. Now that it is proposed to be eliminated, should we expect an explosion in the number of beach cabanas in Seattle? Unlikely, since 2009 we have only spoken with two potential DADU builders who were impacted by this restriction. Of course, they will be quite happy. Meanwhile, the more significant proposed DADU code changes, those that are part of the ongoing EIS process, are scheduled to go before Seattle City Council this summer. 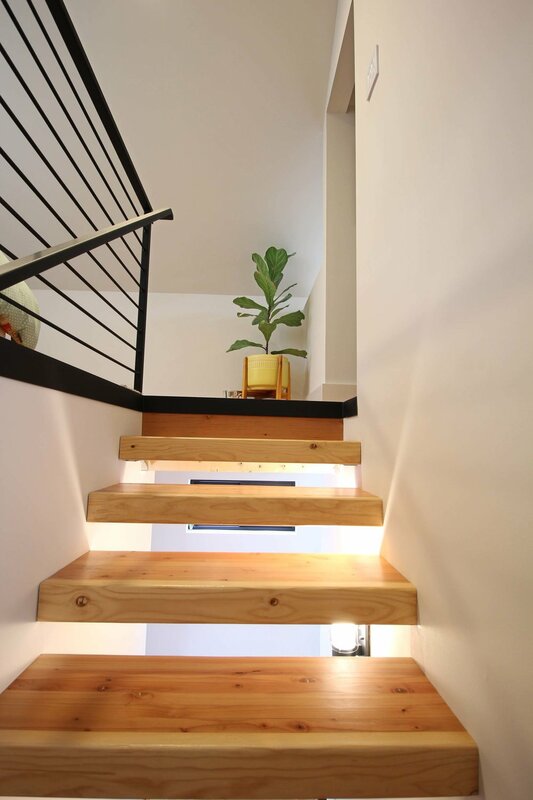 A pocket door located at the bottom of the stairs allows for the two floors to be used independently. The contractor is making some final touches and backyard cottage open house scheduled for the 3rd has been rescheduled for February 24th between 11:00 am and 1:00 pm. For further information about the open house contact us or sign up for our open house invitation list. Come and see one or more new backyard cottages in Ballard on February 3rd between 11:00 am and 1:00 pm. For further information or sign up for our open house invitation list. We are looking forward to another busy year doing what we love, designing backyard cottages. 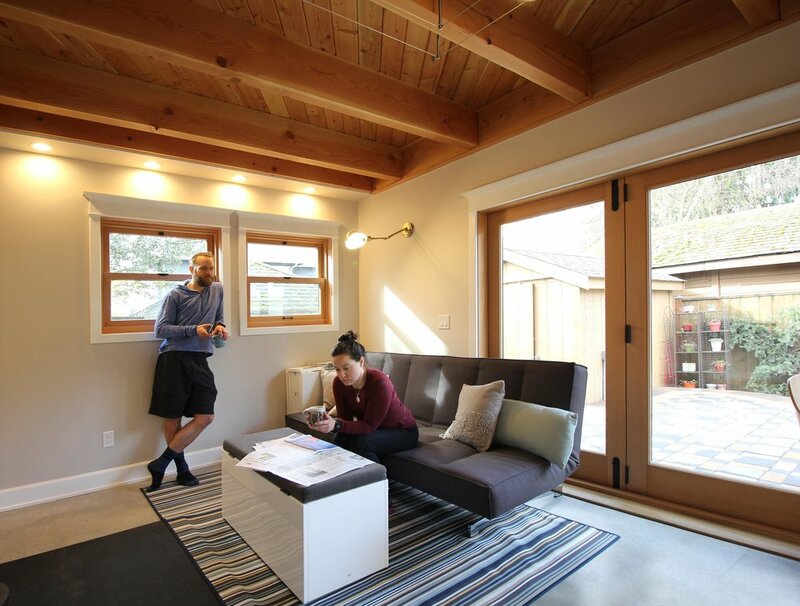 Last year saw the completion of a record number of backyard cottages and 2018 is shaping up to be another big year for ADUs. In 2017 the City of Seattle had a mayoral election during which housing and livability were major themes. The public and policy makers seem to agree that ADUs have, and will continue to play, an increasingly important role in our vibrant city. In 2017 the city proposed code changes to encourage the construction of more backyard cottages and began preparing an EIS to inform the public and policy makers about the possible impacts of these changes. This process is schedule to be completed and the city council expected to vote on the proposed changes this summer. Importantly, the Seattle Department of Construction and Inspections (SDCI) has at long last agreed to clarify the rules governing the size of cottages. We estimate that the current system, which is rife with inconsistencies, adds $1,000 to design and permitting costs and over six weeks to the permitting process. We are working closely with SDCI to ensure common sense interpretations for what is included in the allowable gross square footage are adopted into the next omnibus code update. Even with the support of city council and SDCI, backyard cottages will continue to face hurdles. Intense competition for material and labor will see another year of double digit construction costs rises for the Seattle area. Rule changes under EIS review won't reduce the cost to build a backyard cottage even if more are built. Permitting and construction scheduling will also continue to be affected. SDCI is starting the year with a temporary hold on new building permit intakes and an ongoing 6-8 week increase in review time on projects already in their system. In spite of these challenges backyard cottages are still a great option for many families, we are expecting another banner year for backyard cottages. We will be continuing to do our part in the community to maintain and encourage thoughtful planning and exercise patience as the city rolls out new policies and changes. What follows is a condensed version of our blog. To learn more about backyard cottages and to sign up for our backyard cottage open house invitation list please visit our seattle backyard cottage blog. When Meredith Stannard, 66, retired from her job earlier this year, her soon-to-be-former coworkers couldn't wait to see the backyard cottage she and her partner Elyse Zandonella, 69, had decided to downsize into. "Everybody was curious," she says. "I started doing these happy hours where I'd have one or two people over at a time. There's a lot of buzz with people wondering if they could do this too." Last November, the couple moved from a 1,300-square-foot home in West Seattle to a 613-square-foot cottage in the backyard of a house owned by their daughter Drew, 33, and son-in-law Jacob, 37, in the city's Ballard neighborhood. Their mini-house now stands where a dilapidated detached garage, formerly envisioned as a possible writing studio for Drew, once stood. Click to read more about their experience in country living article by Maria Carter. 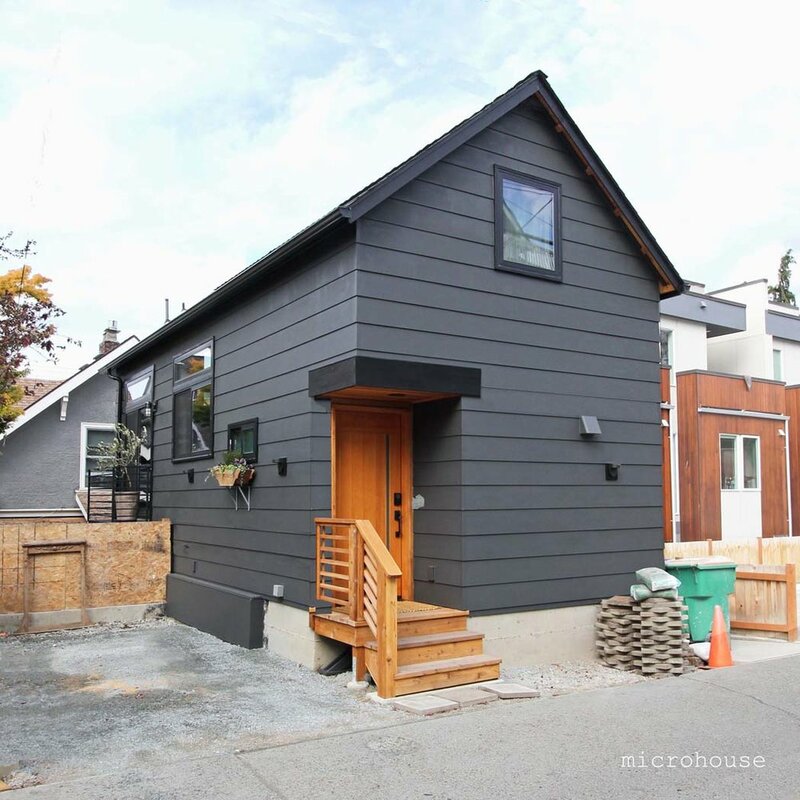 Backyard cottages are a great addition to our city, providing low hanging fruit for increasing urban density while also providing opportunities for families. 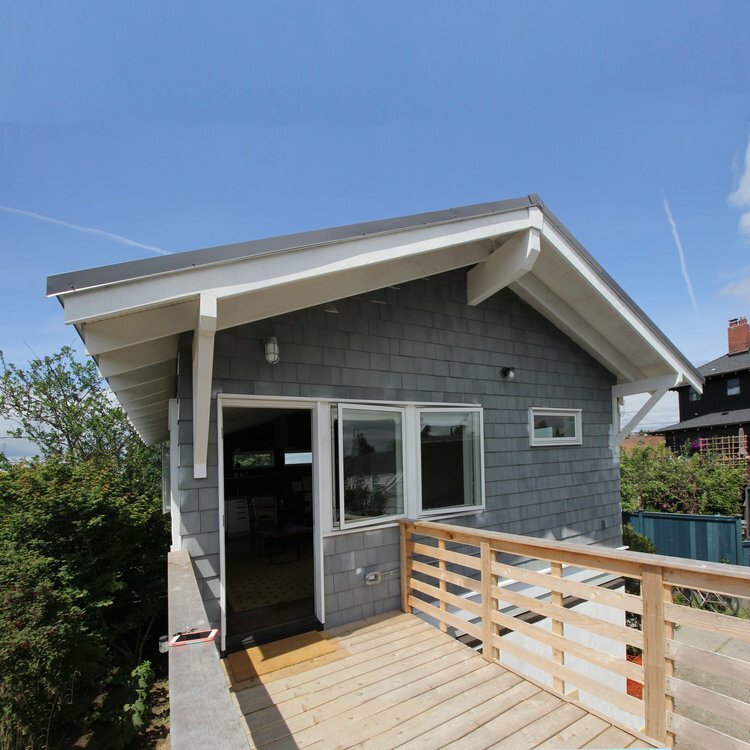 Proposed changes to the rules governing backyard cottages are being studied by the City of Seattle and you get to have a say on their implementation through the Environmental Impact Statement (EIS) process. BCBEB (back yard cottage blog editorial board) ADU EIS cheat sheet guide to the EIS comparison of alternatives. 1. Number of ADU's on a lot: Alternative 1 no action keep one per lot. DADU's built under current land-use have an impact to the built environment but one generally in keeping with current development patterns in SFR zones. Allowing three units especially in combination with the removal of the owner occupancy requirement will lead to SFRs designed and built to be rentals with a much higher combined value. Because the combined rentals will have a higher value than one smaller SFR there will be financial incentive to increase the demolition of naturally occurring affordable SFR housing. In addition, the higher combined value of three units will make their purchase that much less obtainable for a family and more appealing for an out of area investor. It has been well documented in the HALA literature that opportunity gaps exist based on proximity and home ownership. Ownership is one of the primary means of accumulating and maintaining household wealth. This is true for marginalized communities but also for middle class families. Allowing more than one ADU per lot, and eliminating the owner occupancy requirement, will reduce the amount of affordable housing available to families to own. Additional alternatives: Portland and Vancouver give special consideration to alley and corner lots. Vancouver only allows DADU's on lots with alleys. These lots can more readily handle increased development with less impact to the urban fabric. The code should be amended to allow these lots to be segregated to create more small scale SFRs that can be sold independently. 2. Parking: Alternative 2 Remove parking requirement for ADU's. Not a politically palatable but removing the parking requirement will likely not have an environmental impact and will free up yard space for vegetation. 3. Owner Occupancy: Alternative 1- the current proposal to sunset owner occupancy after a period of time is good and should minimize the destruction of naturally occurring affordable housing by speculative developers. The period of time should be 3 years. Owner occupancy should be required for all properties used short term rentals. 4. Reduce minimum lot size: Alternative 2 - we already design many cottages on lots less than 4,000 sq. ft in size and the size of the cottage on smaller lots is driven by lot coverage as it should be. Additional alternatives: Portland and Vancouver give special consideration to alley lots and corner lots. These lots can more readily handle increased development without disrupting the neighborhood fabric. 5. Increasing the allowable cottage size from 800 to 1,000 sq ft.: Alternative 1 - increasing the allowable size 200 sq. ft. is a great idea and makes it easier to fit in two bedrooms. However, Alternative 2 excludes the garage and other storage from this calculation potentially allowing 2,000 sq. ft. ADUs. We frequently design cottages where the garage space is not intended for parking but as part of the cottage. The city can't and shouldn't mandate that garages are used for parking but not including this space in the allowable square footage will unnecessarily increase the allowable size and bulk of DADUs. And will have a negative impact on the character of neighborhoods, the amount of natural light and vegetation available. For the large increase in allowable square footage of Alternative 2 to be considered a corresponding reduction in allowable floor area ratio (FAR) should adopted capping the combined size of the two units. This would allow two smaller more equal sized units to be built. Additional comment: In general the city needs to be more consistent on determining what is included in the allowable gross square footage. Seattle land use code includes all storage areas to the extent that some reviewers for SDCI want to include covered unenclosed exterior space. The current land use code could be tweaked and specificity added to allow more usable storage area. Additional Alternative: Consider going to a combination of floor area ratio (FAR) and lot coverage restriction to encourage the creation of two more equally sized family friendly units. 6. Additional Height: Alternative 1 - while almost all of the cottages we design are built to the allowable height limit the current height limit is adequate for a two story structure. Additional height can reduce the amount of sunlight reaching neighbors yards. The multi-family code has provisions that allow additional height with a consideration for the impact of shading on neighboring properties. Something similar can and should be adopted for DADUs. 7. Lot coverage Limit: Maintain. Yards do have a value both for families raising children and as green spaces and as a way to reduce stormwater runoff. In the world in which we live, small children have almost no opportunity for unsupervised outdoor play. Urban parks that require that children be constantly monitored by a caregiver cannot fill the void. Back yards provide a safe place for children to play, create, and be outside. The alternative is often additional screen time with the corresponding negative health effects. Increasing lot coverage will decrease green space and tree canopy available for habitat for wildlife. Interconnected vegetated corridors can provide valuable habitat for pollinators and other wildlife even within an urban environment. Increasing lot coverage will increase stormwater runoff. As we witnessed, when the west point waste treatment plant went down, we are at capacity for dealing with urban stormwater runoff. The best alternative is to allow stormwater to enter the ground where it can be filtered and recharge streams and lakes. The rainwise program recognizes the value of groundwater infiltration but also importantly that it is less expensive to provide point source treatment than to create new treatment capacity. While it is true that the new stormwater code does require increased on site stormwater management, most backyard cottages are below the size threshold to trigger these requirements. 8. Rear yard coverage: Alternative 2 Recognizing that yards do have a value both for families raising children and as green spaces and as a way to reduce stormwater runoff. 9. Location of entry: Alternative 2. Allow entries 5 ft from nearest lot line with written consent of the neighbor. Additional Alternative: Allow the use of side yard easements and or the ability of zero lot line development for DADUs. This will make it easier to build cottages and allow for a more efficient use of limited yard space. 10. Rooftop features: Alternative 2 -allowing rooftop features, namely shed dormers to extend above the base ("eave height") will not increase the bulk of DADUs allowed under the current land use code and therefore have no negative environmental impact. 11. Household Size: See comment for number 1. 12. Mandatory Affordable Housing (MHA): Mandatory Housing Affordability (MHA) does not apply to creation of ADUs in Single Family zones. 13. Maintain. Property owners renting one or more units, including in Single Family zones, must register for inspections to ensure housing is safe and meets basic maintenance requirements. 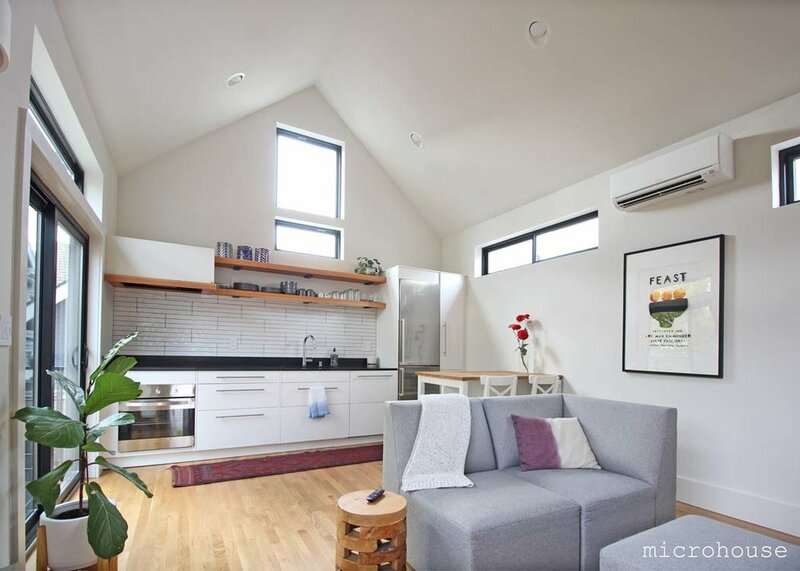 Join us for a unique opportunity to tour backyard cottages (aka detached accessory dwelling units or "dadus") in Fremont, Greenwood, and Ballard. Starting with an open house at 4134 1st Ave NW from 10:00 - 11:00 am. Following the open house will be a tour of other nearby cottages. Sign up for our open house invitation list for more information. How crazy is the Seattle construction market? One indicator is the date on which the Seattle Department of Construction and Inspections (SDCI) will accept new building permit submittals, known as the intake date. SDCI uses intake dates to regulate their work flow. The busier they are the further out the earliest available intake date. This year intake dates have been available about three months out, a considerable amount of time. We typically use this time to gather preliminaries, work on design and prepare construction documents so it doesn't slow us down much. As of yesterday the November intake dates were all taken and SDCI has stopped issuing intake dates altogether. This applies to any construction project, not just backyard cottages. It is safe to assume that new intake dates will be added for the year. It does highlight the unprecedented level of construction activity and increasing complexity of the land use, drainage, and energy codes that are affecting all aspects of the industry.